Despite generations of protest, activism and reform efforts, Latinos continue to be among the nation's most educationally disadvantaged and economically disenfranchised groups. Challenging static notions of culture, identity and language, Latinos and Education addresses this phenomenon within the context of a rapidly changing economy and society. This reader establishes a clear link between educational practice and the structural dimensions which shape institutional life, and calls for the development of a new language that moves beyond disciplinary and racialized categories of difference and structural inequality. is Associate Professor of Education at The Claremont Graduate School, a research associate with the Centro Andino de Educacion y Promocion in Cuzco, Peru and the author of Culture and Power in the Classroom. Rodolfo D. Torres is Associate Professor of Public Policy and Comparative Latino Studies at California State University, Long Beach. Henry Gutierrez is Assistant Professor in the Department of Social Sciences at San Jose State University. 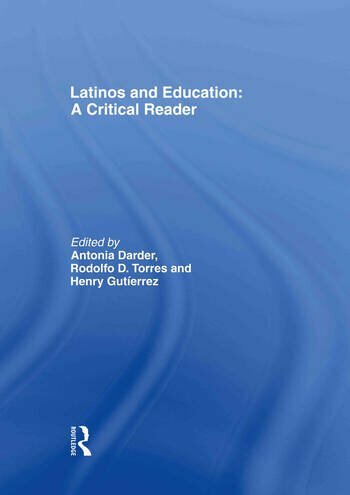 "The purpose of this volume is to provide a variety of per-spectives on Latinos and education, identifying the themes that should inform future debate and critical inquiry on the subject. The first section addresses the need to frame educational discourse within evolving economic conditions, examining class and racialization as these structural characteristics affect Latino communities." --SAGE Race Relations Abstracts, Vol. 25, No. 1, 2/2000."